CM Magazine: In Lucia's Neighborhood. 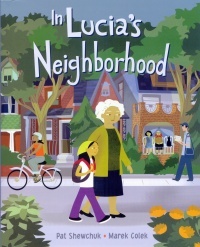 In Lucia's Neighborhood shows a day in the life of a cheerful young girl and her grandmother exploring their neighborhood in what is clearly downtown Toronto. However, readers do not learn more about Jacobs' life and work, except to assume that they have been an inspiration to Lucia's creators. Instead, readers are presented with the unfolding scenes of a 21st century city, including a farmers' market, an off-leash dog area and a street festival. My street is decorated just like in Portugal. Everybody makes the decorations together. But my favorite part will come next. I especially enjoyed the spread of the park with kids on swings and Asian adults going through their tai-chi routine under the trees while some old men feed the pigeons from a bench. Pat Shewchuk is the writing partner in Tin Can Forest along with artist Marek Colek. Together they have produced a comic book and an animated short film, Montrose Avenue, on which this book is based. Shewchuk's text is straightforward and simple in its description of what the girl sees. Marek Colek's illustrations are crisp and colourful in a palette of predominantly clear blues, greens and greys. They are "digitally rendered" in keeping with his background as an animator. Everyone here appears friendly, happy and at ease in their environment. I know that children's books should give us something to aspire to, but as a resident of an urban area myself, I would say that a bit of litter on the sidewalk or a boarded-up storefront would make this pedestrian-friendly area a little more lifelike. A worthy addition to school and public libraries. Ellen Heaney is the recently retired Head of Children's Services at the New Westminster Public Library in New Westminster, BC.